I started 2012 celebrating New Year’s eve in Berlin. I don’t know what celebrating New Year’s is like everywhere in the world, but in Germany, it involved a lot of public drinking and a lot of fireworks. So far, normal, right? Well, I learned that though Germans are extremely careful and safety oriented (I got chastised more than once for J walking) on New Year’s eve, that all goes out the window. 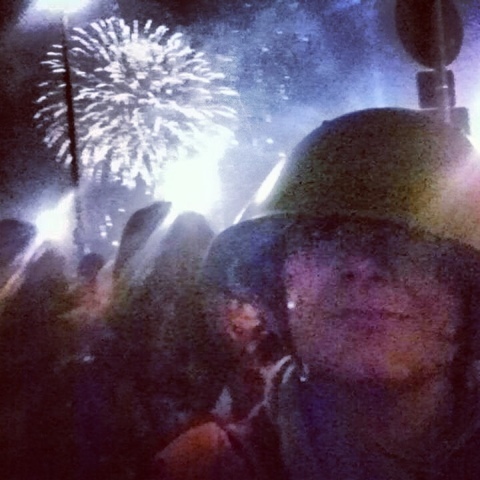 There are few times in my life where I’ve felt physically unsafe and New Year’s eve in Berlin was one of those times (and I’ve gone skydiving!) Originally, we tried to get into the main area by Brandenburg gate, but by 8pm there were already more than 600,000 there and they stopped letting people in. Instead, we were relegated to the outskirts of Brandenburg gate. We had a great time of dancing and drinking at the little cafes while still being able to see the Brandenburg gate for midnight. However, I now know why 600,000 people crushed into the main area. No fireworks were allowed there. You see, on the outskirts, extremely drunk people were launching fireworks from glass bottles on the streets. It was unlike anything else I’d seen in my life. Random explosive devices going off inches away from where people were standing and cars still driving down the streets (and in some cases, driving over fireworks) I was honestly worried for my personal safety and thought it was just a matter of time until someone got glass debris in their eye or their hair went up in flames a la Michael Jackson 80’s pepsi commercial style. So I did what anyone in their right (sober-ish) mind would do: I bought an army helmet! 2 blocks from the Brandenburg gate there was a store selling random kitsch. In this random kitsch, they had a selection of headware. And in that random selection , I found an army helmet. The irony was not lost on me that there I was steps from the Brandenburg gate in Berlin buying an army helmet to protect myself from explosive devices. Completely different circumstances, I know. But the irony was there. I had no idea that an army helmet would cause such a scene. People would see me, laugh and knock on my helmet. I should mention that the helmet was metal so this knocking was extremely loud. At one point, a guy ran up to me, manoevered around the metal edge and kissed me on the cheek. He claimed to be a Syrian freedom fighter that had just escaped Syria and he thought it was adorable that I was wearing an army helmet. It was also a hit with a group of American soldiers. If you have a thing for military men, I highly recommend wearing an army helmet next time you go out. Flash forward to December 15th…. I find myself in Southern Switzerland at a work Christmas party. I also find myself well and proper drunk as you do at a work Christmas party. Our hosts had a climbing wall on their patio and some of us found it appropriate to climb it. At some point, someone had the foresight to equip us with a climbing helmet. After our climbing adventure, we find ourselves dancing again, to Beyonce. So I did what anyone wearing a helmet would do and start dancing along. I started the year wearing a helmet worried for my physical safety in what looked like (for lack of better words) a warzone. I’m now finishing that same year while wearing a helmet because someone else cared enough (or more likely found it funny) for my physical safety. To say that 2012 has been a crazy year is an understatement: I’ve had 2 surgeries in 2 countries within 6 months, moved countries, switched jobs and escaped Germany with the threat of a lawsuit from my former employer, so I’m taking the fact that I ended my year the same way it started but for much different reasons as a good sign. You better be good 2013, I have high hopes for you.